This crispy vegan fried chicken is the ultimate vegan comfort food! If you miss deep fried popcorn chicken, nuggets, or chicken tenders, then this is the recipe for you! Batter your favorite vegan chicken substitute, season it to perfection, and fry it to a golden brown. This is not vegan health food, but it satisfies those cravings for fried chicken and will make your whole family jump with joy! Perfect for special occasions, parties, and to show people how delicious vegan food can be. 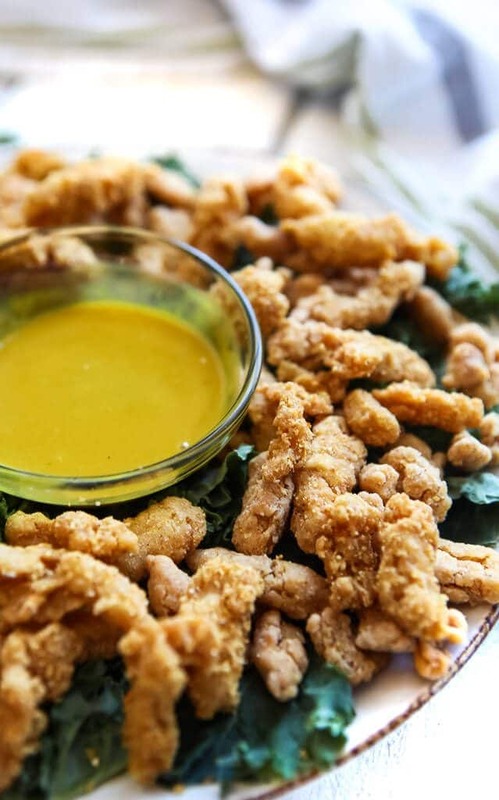 Kids go crazy for these vegan popcorn nuggets and even my kids’ meat-eating friends have said that they taste just like real popcorn chicken. It will satisfy your cravings for fried chicken. It’s vegan, gluten-free, and can be made soy free too! You can make it with any vegan chicken product that you like. 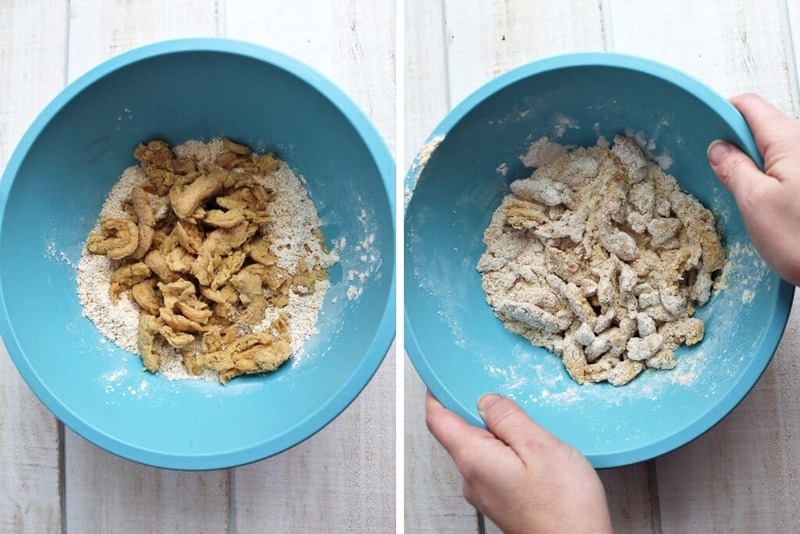 You can use this basic recipe to make any shape you want like nuggets, strips, or patties. It can be baked instead of fried for a healthier alternative. 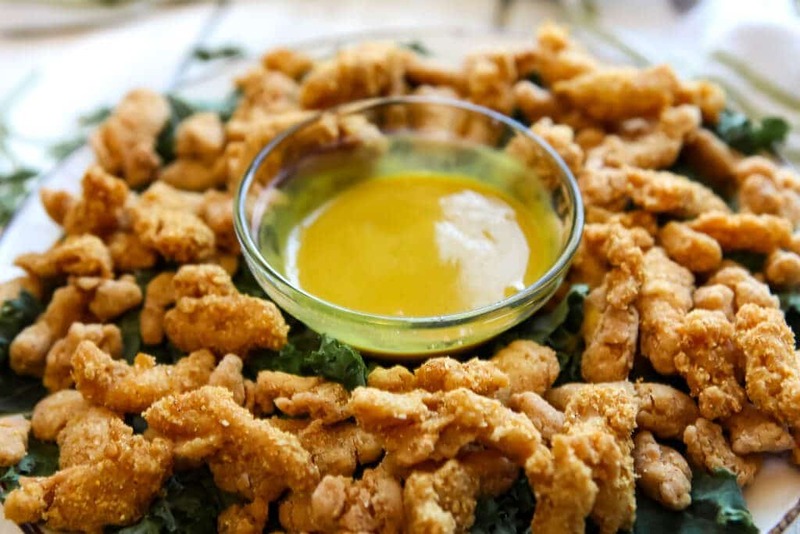 Use the basic coating recipe to make any type of vegan fried chicken that you want, like vegan chicken nuggets, chicken patties, or popcorn nuggets! The breading is light and crispy and seasoned with a perfect blend of spices that will ensure you never miss KFC! A vegan “chicken” substitute – See the list below of choices. Flour – All-purpose white flour or any gluten-free flour mix. (I use Trader Joe’s all-purpose gluten-free flour mix). Corn Meal – This gives it a little crunch and texture. Corn Starch – This makes it crispy. (You can substitute this with potato starch if you would like). Seasoning – Cajun seasoning mix or Tony Chachere’s creole seasoning work great and make it easy. You can and ¼ teaspoon each of cayenne pepper, black pepper, paprika, chili powder, and garlic powder. Ali from Gimme Some Oven also has a great homemade cajun seasoning mix. Baking Soda – This makes the batter expand a little when frying and gives it a light, airy, crispy texture. Salt – For flavor. The amount needed will depend on if there was salt in the seasoning mix that you used. If you use a mix like Tony Chachere’s, then do you not need to add additional salt. If your seasoning mix is salt-free, then you need to add about ¾ tsp of salt. Oil – For frying your “chicken.” (I use canola oil). Frier – It’s easiest to use a deep fryer if you have one, but you can also use a saucepan filled with oil and a skimmer strainer to get your fried chicken out of the oil. Butler Soy Curls – I use this for mine since they are gluten-free. I also like that they are self-stable until you rehydrate them. They also have a similar texture to real chicken. Use the longer ones for vegan chicken tenders, and the shorter ones for vegan popcorn chicken. Rehydrate them in Not Chick’n Broth or Better Than Boullion No chicken base. 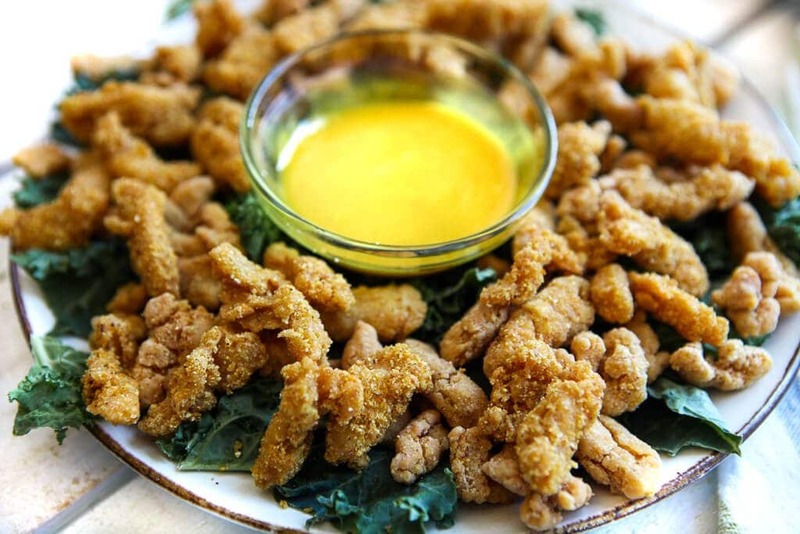 Beyond Meat Chicken Strips – If you want a gluten and soy free option this is perfect. Seitan – Seitan is a meat-like product made from wheat gluten. They sell a chicken flavored version that works great with this recipe. Tofu – If you don’t like the chicken substitutes, you can coat tofu in the breading and fry it as you would the chicken products. Jack Fruit – You can buy this in a can of brine. It has a stringy meaty texture similar to chicken. How do you make vegan fried chicken? 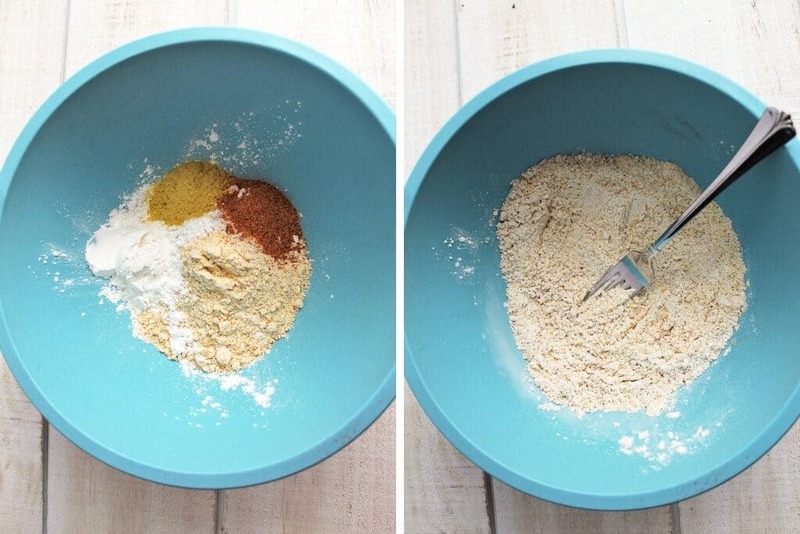 Add cornmeal, flour, corn starch, nutritional yeast, seasoning, and baking soda to a mixing bowl. Stir the dry ingredients until well mixed. If using soy curls, rehydrate 2 cups of them in 1 cup of vegan chicken-style broth, like “Not Chick’n.” Allow them to soak up the liquid for about 5 minutes. Scoop out with a slotted spoon and toss wet soy curls in the dry coating mixture. Shake the bowl tossing the soy curls until they are coated in the breading. Allow them to thaw until they’re soft. Dip them into a plant-based milk or aquafaba (the liquid from a can of chickpeas) to make them wet so the coating will stick to them. Drop them into the bowl of dry ingredients and shake until they are coated in the breading. Drain and press the tofu and cut into the size you want. Toss tofu into the dry breading mixture and toss until well coated. If your vegan “chicken” is wet to start like soy curls, seitan, tofu or jackfruit, just toss it into the breading mixture. If it is dry, like a packed chicken strip or chicken patty, dip it into a little plant-based milk like soy milk and then coat it with the dry mixture. 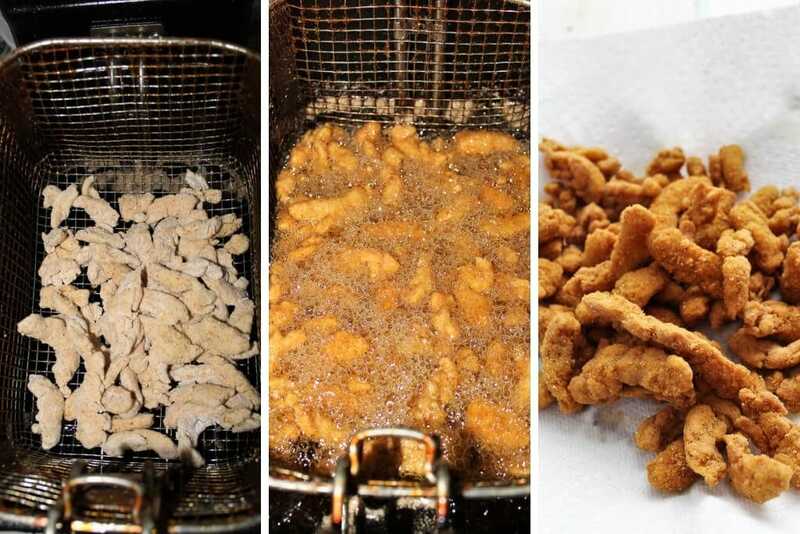 Deep Fry – This method will give you the most traditional taste and fry the “chicken” evenly. Set your deep fryer to 370° F and wait for it to come up to that temperature. 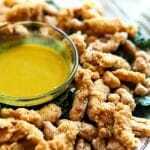 Put about 1 ½ cups of the breaded “chicken” into the frying basket and lower it into the oil. Fry for about 3 minutes until it they float to the top, the bubbling decreases, and they are a crispy golden color. Pour onto a paper towel to soak up any excess oil. Pan Fry – This will also work well and taste authentic; however it is just a little harder to get them evenly cooked. Put a generous amount of oil in the bottom of a frying pan and turn heat to medium-high and allow the oil to heat up to 370°F. (If you don’t have a thermometer, take one small piece and test it. Put it in the pan and see if it sizzles and starts to brown after about 3 minutes of cooking). Place the breaded vegan chicken into the pan using tongs. (It will spatter, and you don’t want to splash the oil). Fry on each side for about 3 minutes until golden brown and turn with tongs until all sides are golden brown. Baked – This is definitely a healthier option, but it will not have that authentic fried chicken taste without the oil. Place the breaded chicken on a cookie sheet that has been lined with parchment paper. Spray the vegan chicken nuggets with spray oil. Baked at 425° F for 7 minutes. Flip the vegan chicken and spray with oil again, and bake for another 7 minutes. *Air Fryer – I have not yet tried this recipe in an air fryer since I don’t own one myself. I have had many requests for a conversion to make the vegan fried chicken in an air fryer, so I did some research for you. I found this excellent article detailing how to convert recipes to an air fryer. According to the article, I would suggest following the instructions for the baked version, but lowering the temperature to 400° F. If you try it, please leave a comment and let us know how it turned out for you! What are good dipping sauces for vegan chicken nuggets or vegan popcorn chicken? 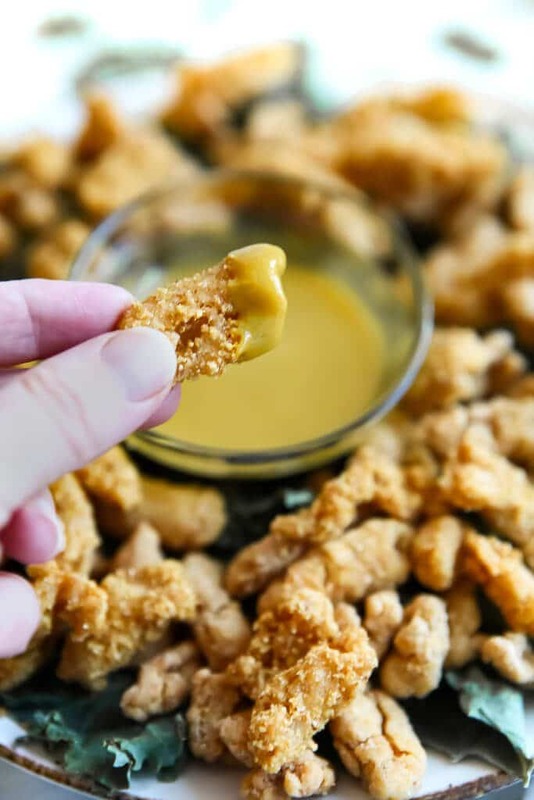 We love to dip our popcorn nuggets in vegan honey mustard sauce or my refined sugar-free barbeque sauce, or vegan buffalo sauce. You can also use ketchup, sriracha, or any other dipping sauce that you like. Don’t forget to pin this vegan fried chicken recipe for later! A recipe for the best vegan fried chicken you will ever eat! Made into nuggets, patties, or popcorn chicken style, this recipe can be gluten free and soy free too! Set on a paper towel to cool and soak up any additional oil. Put a generous amount of oil in the bottom of a frying pan and turn heat to medium-high and allow the oil to heat up to 370°F. (If you don't have a thermometer, take one small piece and test it. Put it in the pan and see if it sizzles and starts to brown after about 3 minutes of cooking). Fry on each side for about 3-4 minutes until golden brown and turn with tongs until all sides are golden brown. My teenager had some non-vegan friends over and they ate a triple batch with your ‘honey’ mustard sauce. Unreal! Thank you! Aww, Thanks Julie! That makes me so happy to hear! We don’t ALWAYS have to be healthy right? But it is better than fried chicken and it looks absolutely delicious! Can’t wait to give it a try. These looks SO good! I’m thinking that they would be great in an air fryer too. My non-vegan husband likes soy curls so I’m definitely trying this!! I wonder if these would be good cooked in an air fryer? Looks great – I’d like to humbly request adding instructions for an air fryer also. I’m sure I can guess at cooking times with it, but I don’t always trust my skills. Any advice you have would reduce my trial-and-error approach.